Ridiculous or revelation? Are there sacred messages hidden in our “silly” dreams? Is Heaven communicating even in the seemingly random pictures of our night visions? God answered these important questions for us when He declared He would reveal Himself in visions and speak to us through dreams (Num. 12:6). He went on to explain, “I have also spoken by the prophets and I have multiplied visions and used similitudes…” (Hos. 12:10 KJV). We know in Scripture dreams are sometimes referred to as “visions of the night” or “night visions” (see Job 33:14-18 and Daniel 7:1-2, 7). But what in the world is a similitude? According to Dictionary.com, it is “a semblance or image; a likening or comparison in the form of a simile, parable, or allegory; the match or counterpart of another.” A similitude is when we use one thing to compare or explain something else that is like it. We recognize this happens easily and often while we sleep. Dreams – our “multiplied visions” of the night – are full of images which tell a story that is a counterpart to our waking world. Even though the dream uses symbolism, the message matches up with our waking life situation and we can receive heavenly revelation through it. Let me share a couple of examples so you can begin looking for God’s similitudes in your own nightly visions. In the fall of last year, my husband Leo and I had the privilege of ministering in several European nations. I taught how we can learn to hear God through all our dreams – even the crazy ones! Everywhere we went the message resonated: people immediately began remembering their dreams and making sense out of them. It was exciting to see God’s truth transfer across languages as our anointed translators communicated the principles in German, French, Croatian, and Hungarian skillfully. However, there was one specific lesson on dream work that I could not easily share overseas. It was the understanding that Father often speaks in puns and parables, idioms and similitudes to communicate His messages to us. I love this revelation because it illustrates so beautifully how God speaks our language. He relates to us in ways we understand and in so doing, He identifies Himself with us. I didn’t share examples of my own dreams with English idioms and similitudes because that wouldn’t translate well to an audience in Vienna. But in Brussels, one of my Christian Leadership University students was able to offer her dream as a perfect example of God using a Dutch saying to communicate His truth. Of course her story immediately resonated with the Belgian listeners and they quickly grasped God’s playful use of their native tongue. 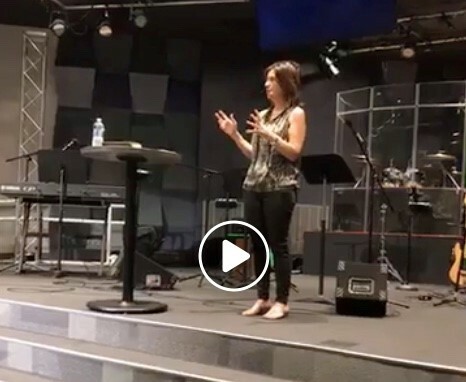 Discover the encouraging revelation God gave Isabelle through her dream about tiny cigars in this three-minute video clip. Her testimony illustrates well how if we look at situations in the natural, we can end up feeling guilty, overwhelmed or stressed out. That is why God invites us to look not at what is seen, but what is unseen (2 Cor. 4:18). He instructs us to seek the things above and to set our mind on the spirit (Col. 3:1-2; Rom. 8:5-6). Dreams are bridges to the unseen spiritual realm where we are able to glimpse God’s point of view and His heavenly perspective. God is never anxious or stressed, so when we see our life the way He sees it, we won’t be stressed out either. This is a huge gift of dream work! Once we see what God sees, we will feel what He feels and experience His Kingdom emotions of peace and faith and joy (Rom. 14:17). Similar to Isabelle, I had a situation in my waking life that was worrying me. I was anxious, but God wanted me to see the circumstance the way He did, so I could feel as calm and confident about it as He felt. That’s why one evening as I slept Father spoke through a familiar phrase in my own language, giving me His take on the stressful situation. I had a dream in which my friend, Eunice Adou, was upset because she ran out of milk for her dinner party. I was helping her get ready and told her it didn’t matter, as nobody coming to dinner even drank milk! It was also significant that in the dream, I became the voice of God, conveying His perspective to the worried person. In waking life, I was distressed and He was helping me and trying to calm me down. In the dream, it was my friend who was distressed and I was the one helping her and trying to calm her down. I was able to see things the way God sees them, to know that there’s nothing to be worried about. I understood that because I had just dreamt it and felt His peace. I experienced His vantage point while I slept, so it was easy for me to then adopt His perspective in waking life, too. Our loving Father is showing us His point of view through our visions of the night, every single night. He is speaking in similitudes and multiplying visions while we sleep to show us His perfect perceptions and purposes. Once we see what God sees, we will feel what He feels and then can act accordingly. Again, this is an incredibly powerful way the Lord uses all our dreams – even the crazy ones – to enlighten and counsel us. He shows us His version of our lives, our health, our finances, our relationships. True vision is seeing through God’s eyes, through the lens of Heaven, receiving divine downloads of direction, consolation and revelation. When we see what He sees, we move out of fear and into faith. We move out of stress and into peace. We move out of overwhelm and into Father’s joy, His presence, His very heart. When we see what God sees, everything changes. And the first thing to change is us. If you want to learn more about this personal way God speaks to us at night, check out Chapter 6 of Hearing God Through Your Dreams or watch The Fun Form of Dreams session on our DVDs. We explore several more examples of what puns and idioms look like both in my own dreams as well as in the original languages in which Scripture was written. Because most of us don’t read our Bibles in Hebrew or Greek, the Lord’s skillful use of wordplay is lost on us. That is why in our training we examine passages as the initial readers would have understood the meaning, discovering Father’s playful heart revealed in both the Old and New Testaments. He is a good God, and He’s in a good mood.